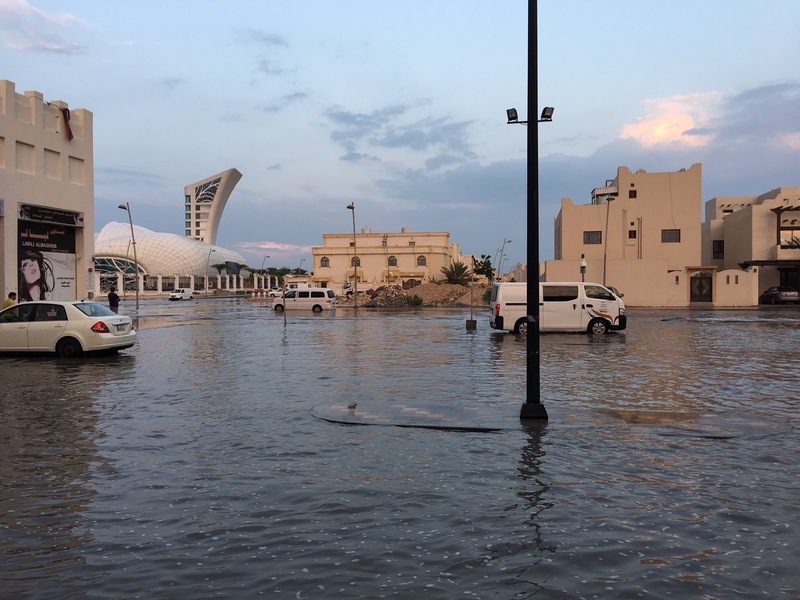 Several roads and low-lying areas in Qatar were waterlogged after heavy rains lashed the country for about a couple of hours on Saturday afternoon.The rains were accompanied by thunder and lightning in some areas. The Meteorology Department has forecast more rains accompanied by strong winds on Sunday. What started as a drizzle in the morning hours, turned out to a heavy downpour after noon, making it difficult for motorists to negotiate the flooded streets and roundabouts. Since it was a holiday for most of the government staff and schools, traffic was light as compared to weekdays. There have been reports of rain water entering several homes and leaking roofs at prestigious malls. According to sources, the affected malls included Villaggio and Landmark but there have been no reports of major losses or injuries. Some sections of Safari Mall in Abu Hamour experienced a power outage for about half an hour. “It was a minor problem. The connection was re-established in half an hour. Operations at the hypermarket and the other outlets were not affected,” said a spokesperson. As the rainwater accumulated in low-lying stretches of roads and lanes, motorists found it difficult to drive and in some cases had to leave their vehicles and look for other means to reach their destination. Sources said some of the underpasses were also flooded. 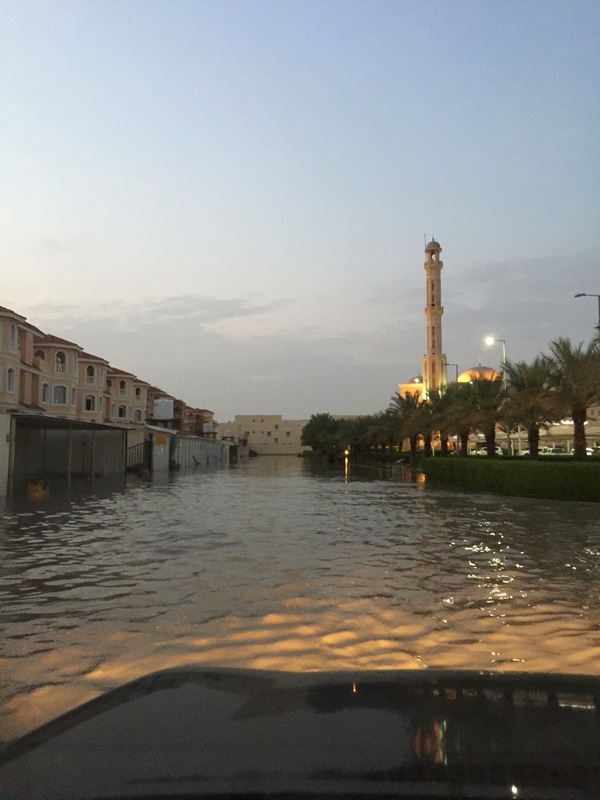 On Saturday, the Abu Hamour area in Doha received the highest rainfall in the country – 35.3mm – until 5.30pm, according to weather charts. Next was Al Sheehaniya with 27.3mm, followed by the Doha International Airport area with 23.3mm, Shehaimiya 22mm, Batna 19.1mm, Wakrah 18mm and Dukhan 15.8mm. Low-lying areas in Aziziya, Abu Hamour, Maamoura, Messila, Muaither, Rayyan and Najma were found to be waterlogged and several residents found it difficult to enter their houses as water collected on the lanes in front of their homes. Residents of the Industrial Area said they were particularly hit as there were large craters on many of the roads there and these have now become cesspools, making the streets off limit for small vehicles. Though the authorities had pressed tankers into service to drain the water on stretches of streets and low-lying areas, the work is expected to take several hours. Meanwhile, the Ministry of Interior has issued several safety measures for motorists to ensure safe driving. The MoI advised motorists to drive slowly, keep a safe distance between vehicles, avoid sudden braking, use indicators while turning and not to use hazard lights. Thundershowers are again expected in parts of Qatar on Sunday along with sudden strong winds, the Met department has said. Offshore areas too are likely to see strong winds today along with high seas and thundery rain. The detailed forecast for inshore areas is that the wind speed may go up to 25 knots during thundery rain. Cloudy conditions are expected along with a chance of scattered rain, which may be thundery at times, and it will be relatively cold by night. The wind speed, meanwhile, may reach a high of 22 knots in offshore areas on Sunday, with the sea level rising to 8ft during thundershowers. In general, cloudy conditions are likely along with scattered rain, which may turn thundery at times. A minimum temperature of 20C is expected in Abu Samra and Al Ruwais on Sunday, while in Doha it will be 22C. The maximum, on the other hand, will be 28C in Doha and Mesaieed, according to the Met department.